Could the health benefits of yoga change your life? Yoga is not a religion. Although it came out of ancient India, it is not a form of Hinduism. Modern yoga dates back to 1893. Christians, Buddhists, Jews, Muslims, and Atheists alike happily practice yoga. There is certainly a spiritual side to yoga, but you do not have to subscribe to any particular belief to experience the health benefits of yoga. Yoga is a systematic technology to improve the body, understand the mind, and free the spirit. The health benefits of yoga include increased flexibility, more strength, added energy, and a thinner, more youthful appearance–all of which are desirable in Adrenal Fatigue recovery. With practice, you are strengthening and calming the nervous system. It balances the dysfunctional stress-response system suffered by most in Adrenal Fatigue. Blood flow to internal organs is increased; more oxygen is delivered to the adrenal glands for healing; mental clutter is cleared. Spiritual as well as physical muscles are cultivated to make you happier, less anxious, and more at peace. Because yoga builds on itself, the health benefits of yoga become more effective over time. It is equivalent to learning how to play a musical instrument: the longer you stick with it and practice the better you become and the more you get out of it. Adrenal Yoga takes the best of traditional yoga and modifies it to suit those with Adrenal Fatigue. For example, certain stretching and strengthening exercises known as asana are removed, because they can stimulate the SNS. Gone are certain breathing techniques are known as pranayama that can trigger a release of adrenaline. Posture and lung capacity are improved as is bowel function, lymphatic draining, and the function of the immune system. Gradually one feels more balanced and the body is better able to endure the stress of daily living. Adrenal Yoga then is about restoring internal balance, and with balance, internal control. It is not about physical flexibility, as many with Adrenal Fatigue are already quite flexible. It is not about increasing strength, as many men are strong and still suffer from Adrenal Fatigue. Adrenal Yoga is able to transform liabilities such as fear, inability to relax, low energy, anxiety, and depression into strength, giving the person exercising more control and a more balanced feeling. Adrenal Yoga is a special form of therapeutic yoga that is gently nurturing by design. It places heavy emphasis on body awareness; rhythmic adrenal breathing that is stimulatory, proper postural alignment, and movements that tone muscles. Special attention is placed on slow and relaxed motions that are suitable for all, including those that are in advanced adrenal failure and possibly close to being bedridden. Science now realizes that changing dysfunctional habits is largely a matter of the mind. Adrenal Yoga helps by giving you greater control of your mind as well as greater understanding of the tricks it can play. This, perhaps, is what leads to a life transformation. This is particularly important in Adrenal Fatigue when emotional stressors are the major cause of dysfunction. Those with advanced adrenal weakness will especially appreciate Adrenal Yoga and its transformational power. Adrenal Yoga focuses on enhancing and restoring parasympathetic nervous function by teaching the mind to work against the opinion. By slowing down the fluctuations of the mind, you can get in touch with a more blissful place inside. With practice, you will become more aware of a calmness at your core throughout the course of the day. It helps you to realize that much of what you routinely get upset and anxious about is not that important. It’s almost like toning down the repetitive obsession we have subconsciously about past resentments, old glories, and worries about the future. It puts our fear, desire or hate in a balanced perspective that can be dealt with in a systematic and logical manner. It forces us to stay with the present. It lowers breathing and heart rate, increases blood flow to internal organs such as the adrenals, intestines and reproductive organs, and allows you to rest and digest. Many Adrenal Fatigue sufferers have concurrent gastric and assimilation difficulties. Adrenal Yoga enhances the relaxation response and avoids active stimulation of the SNS from exercises like backbends and strong pranayama technique. It lowers the level of cortisol when high, and modulates blood sugar levels. It does not quarrel with science but supplements science. Adrenal Yoga, therefore, complements modern medicine’s strength by providing more options for people in need of healing. Adrenal Yoga is a holistic emphasis on strengthening your body and mind. It helps you get the most out of whatever other care you receive alternative or conventional therapy for your Adrenal Fatigue. The Adrenal Yoga exercise series is, therefore, comprehensive and unique. The entire series is broken down into twenty-one sequential sessions that are grouped into three modules. Each module embraces specific themes customized to gently and effortlessly nurture the adrenals back to health. These themes are laid out in different sessions lasting anywhere from thirty-to-sixty minutes each. Each session, in turn, consists of a well-designed sequence of gentle postures that collectively offer a profound healing effect. The key to success is to start slow and progress through the sessions gradually and consistently, using the adrenal breathing technique throughout. Beginning Adrenal Yoga focuses on breathing and stretching. This forms the foundation of internal control. Intermediate Adrenal Yoga focuses on strength and toning. This serves to reverse the catabolic state and stabilize metabolic function. Advanced Adrenal Yoga focuses on fluidity and control. This serves to fine tune internal body homeostasis. 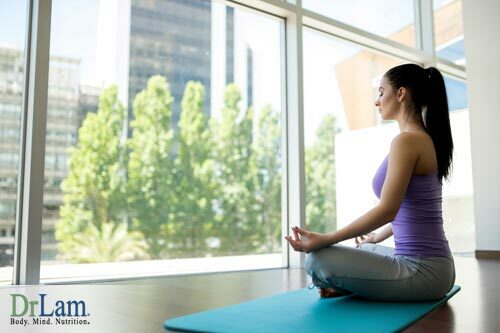 Many have gone from being almost bedridden to an active lifestyle with the help of Adrenal Yoga. The entire series can be achieved in three to six months. When you are done with the Adrenal Yoga series, the body is fit and toned. The internal tune-up has been accomplished, muscular definition returns. The core body function is optimized. It comes as no surprise that people report a great increase in energy, reduction in fatigue, better blood sugar balance, stable blood pressure, increased sense of calmness and reduced anxiety.